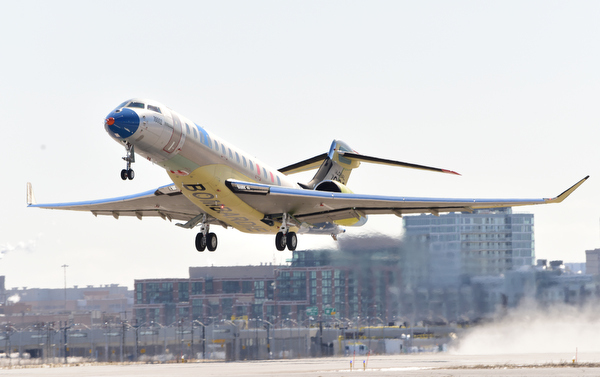 With more than 2,400 hours logged to date, flight testing of Bombardier’s Global 7500 is now complete, company president and CEO Alain Bellemare told financial analysts today during a second-quarter conference call. Certification and entry-into-service of the new 7,700-nm business jet are “on track” and expected by year-end, he said. Though it’s unclear how many 7500s will be delivered this year, Bellemare estimates that 15 to 20 will be handed over to customers in 2019. The company finished full-scale structural testing earlier this year, while full-scale fatigue testing is “executing to plan,” with one lifetime of simulated flights already completed. In addition, Bombardier is ramping up Global 7500 final assembly in Toronto, with 20 aircraft now in various build stages on the line. In June, the first production aircraft arrived at Bombardier’s Montreal facilities for completions. As part of the production ramp-up, Bombardier is working with its supply base “to ensure every supplier is equipped to support the program’s success.” Notably, it said, “We are having ongoing commercial discussions with our wing supplier, Triumph. As part of these discussions, we aim to support Triumph’s needs, while also sustaining the long-term success of the Global 7500.” In May 2017, Bombardier and Triumph reached a settlement on legal action filed by the latter over delays and escalating costs associated with the Global’s wing.